The Schroth Method was established in Germany in 1921, by Katharina Schroth. 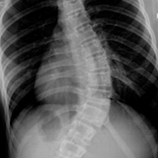 This breathing and exercises technique for treating scoliosis, always according to individual curve pattern, has helped patients with scoliosis who have learned it immensely. The method originated when Katharina was told she had scoliosis and doctors fit her with a scoliosis brace made of steel. Inspired to improve scoliosis without wearing a brace, she immediately began to devise a way to stop scoliosis from progressing. It soon became her life’s work and she began to teach others. Her daughter, Christa Schroth (Christa Lehnert-Schroth) became an instrumental part of her practice. She assisted her mother from a young age and went on to become a physical therapist. Her contributions throughout her lifetime helped advance the method. Christa’s son, Dr. Hans-Rudolf Weisss is the third generation to carry on the family legacy. An orthopedic physician, he is the former medical director of the clinic bearing his grandmother’s name having overseen the treatment of tens of thousands of patients with scoliosis over the years. His knowledge of scoliosis is immeasurable. He is widely published and there is no higher authority on the topic of conservative scoliosis treatment and 3D bracing for scoliosis. He reintroduced the method to the world in it’s current form as Schroth Best Practice. Dr. Moramarco has had the pleasure of knowing and working with Dr. Weiss since 2002. The newest version of the Schroth method offers improved alternatives for patients with scoliosis. Under his guidance, the Schroth Method has spread all over the globe as scoliosis patients look for alternatives to watch and wait, bracing, and surgery for scoliosis treatment. Dr. Moramarco is the Advanced Schroth Best Practice instructor in the United States. Barcelona trained therapists are not Schroth Best Practice therapists. There is a difference!